This post is brought to you courtesy of my mailbox. Since I did not leave the house yesterday, I checked the mail today. There were three envelopes inside. One was the power bill. It was the only thing I received which I didn't like. From my sister, Jackie, came an ancient photograph (see left). 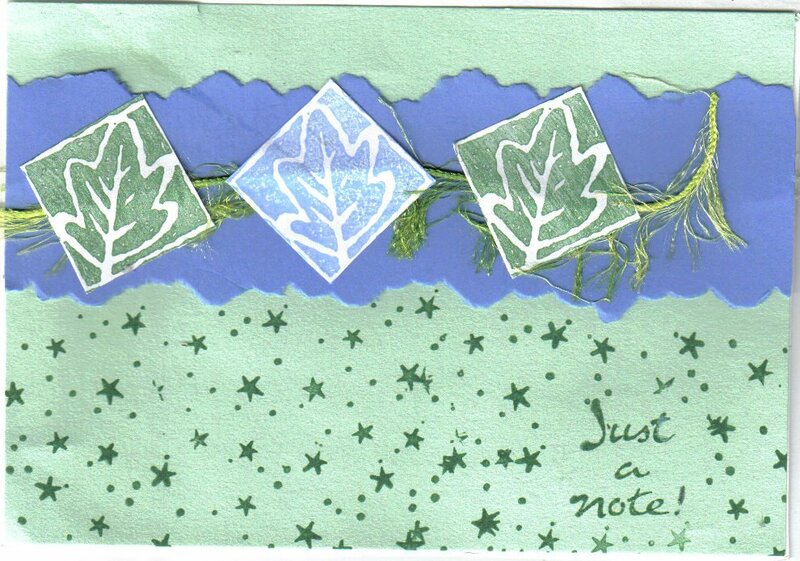 She mailed it inside a gorgeous card (see above) made by my sister, Caryl. The photograph was taken in 1975. I was fourteen years old and I lived in Bonner's Ferry, Idaho that year with my father and step-mother. We used to go Square Dancing every Wednesday and Friday night. We are dressed for that event. My step-mother is on the left. 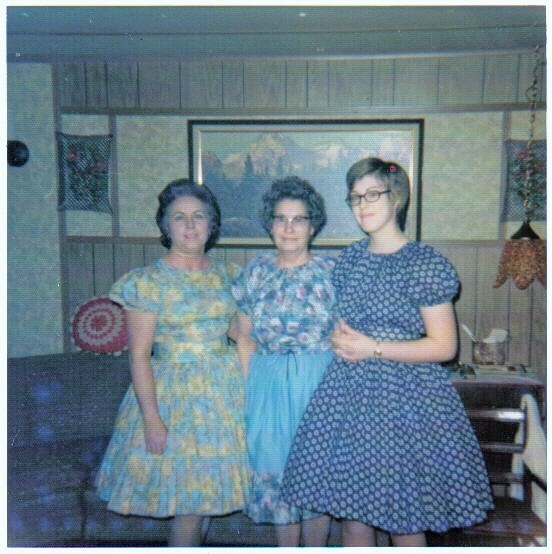 My Gram is in the middle, wearing a dress I made. I am on the right, also in a dress I made. I am the tall one in the picture. That's a rarity since I'm only 5'4". The third thing my mailbox yielded was the information that my poem, Substance, has made it into the elimination round in a poetry contest. I entered the contest knowing it is a money making gimmick, but I've made it into the "you don't have to pay us to publish you" category, and am on my way to the, "we'll pay you," list. I am a bit curious though why the judges thought, Substance, a better poem than, Battered Rose. Oh well, as a poet I'll never make famous, but who needs fame when I have all of you? I loved your comment so much on my blog, I felt the need to swing by and say..... YOU HAVE BEEN TAGGED! Please stop my my blog and see the latest post for what you have been tagged with. My comment on your blog was lame -- though I did like the sidewalk art. I am certain you tagged me because you don't know me. Better to tick off a stranger than the folk you want to like you. I'm certain you realize that in the same vein I am free to decline the tag without offending you. Just stopping by again now that you have found a way I can get around the nice folks at blogger and their segregation of Beta Bloggers and Non Beta Bloggers. It is nice to get one on the Organization. Almost feels like the "Underground" and getting back at the evil forces who seem to think they know what is best. PS, I remember my Mum making clothes as well. We couldn't afford store bought clothes, only for special occasions. My Mum would knit as well and there would always be a pair of mittens or socks at Christmas under the tree. Momma used to square dance, I was to young, I went with her, just because they let me have refreshments. It was the only time I got to drink some hot tea.....and I loved it. 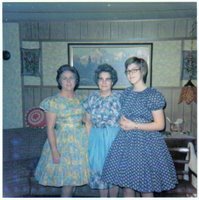 It is a great picture, your step Mom and Gram make you look really tall huh, haha I just realized, I had never seen any pictures of you at all before. Who knows how they assess the respective value of different poems. I'm not even sure I know what 'poetry' is. I have a copy of that picture in my photo album... it's one of the few pictures I have of Grandma. I love it. I had no idea you'd sewn the dresses. Very impressive! Here's hoping you win the poetry contest! Well, I think both of your poems are wonderful! You just never know WHAT they are looking for for the "current" anthology they are creating. Substance may have fit in better because it rhymes, or because it's happy, or because it's shorter... you just NEVER know! I've had two two that would have been published -- but I DON'T pay! LOL! If you'd like to read them let me know -- I'll link you up! Donna& Bill -- I am glad you were able to escape the clutches of Blogger to post your thoughts! Nea -- my failure to post any current pics of myself is not an oversite. And how can you not find my poetry page when the names of the poems on this post are links? When you get confused you go all the way! Nice, Niece Brooke: I have two photos of Gram. This and a 3x5 taken the year before she died. Bazza: compared to the crafting talents of the rest of my family I am pretty much a slacker. 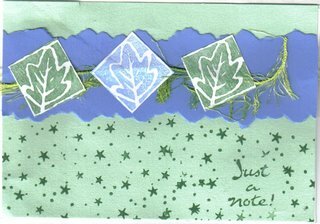 My sisters paint and create -- like the card posted -- without patterns. The only thing I can fabricate from thin air are stories. I build with words. Melli -- what are you doing here on your birthday? You should be out being feted and pampered. And I would love a link to your poems!